A set of new pictures have leaked out showing the front and back of the LG G2. We can see the 5.2 inch 1080 x 1920 FHD screen in all of its glory. On back, with the battery cover off, we see that the phone will have a 2610mAh cell. We can also see clearly the volume rocker that has been given a place on the back of the phone, a unique placement that makes the handset stand out. LG also released a teaser for the phone, highlighting the placement of the volume controls. Check it out in the slideshow below. Earlier on Tuesday, we told you how the North American version of the phone showed up at the FCC with HSPA and LTE connectivity for AT&T and T-Mobile, not to mention the major Canadian carriers. With LG crossing off items on its "things to do list," the Korean manufacturer is trying to get everything done in time for the August 7th unveiling of the device in New York City. can i get a GE G2? Thought LG wasn't working on the next Nexus device. Maybe they just weren't allowed to say yet. is there another button on the back besides the rocker buttons? Yes. Power button is the oval between the up/down rockers. Not sure if that's sarcasm or a commendation. Well I'll go with Sarcasm. 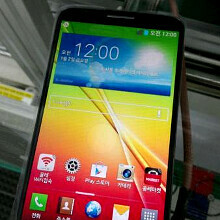 removable battery + hopefully FM radio... other specs are expected like Snapdragon 800... I want this! Monster phone running a children's themed UI lol. Touchwiz UX 2 > Sense 5 > Moto's UI > Huawei's Emotion UI > Sony's UI > LG's UI. I don't think LG's UI is the worst. Even with reviews here on PA that Optimus L7 II dual is stuttering, it is snappier than my GS3. Looks very promising! Probably LG's new game changer? Any last words, LG prejudiced haters? Yes, change the damn UI. LG WILL CHANGE IT ALL!!! It's just so gorgeous. Damn, just look at that gorgeous thing! It's freakin gorgeous! I really hope this is going to be the next NEXUS 5 phone! i tell you what though, the G2 is a really gorgeous device.